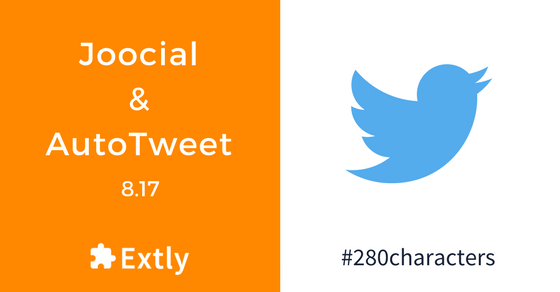 Twitter has expanded the tweet limit of 140 characters to 280 characters. We can already find tweets that are fully embracing the new freedom to write longer texts. We have adjusted the extensions accordingly. Facebook is adding new controls to limit the content of posts to the authors. We are actively following the topic and releasing new versions to be updated with the latest news. In the previous change, Facebook mandates to keep the Open Graph Tags syncronized with Posts of content items (Changes to Facebook post publishing rules). Now, with the release of API 2.11, Facebook has added a validation to associate Pages and Domains. So, posts can only be published to Verified Domains. This control does not affect directly to the extensions, but it is a new configuration step that has been added to the authorization workflow: Facebook Link Ownership Guide. The new AutoTweet and Joocial 8.17 beta version are available in the Download Area, and the stable versions are going to be released in the next week.